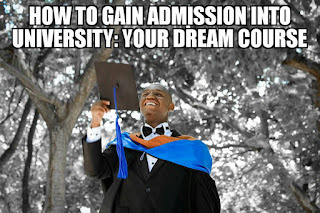 How to gain admission into the university: for your dream course. We have had students waste several years of their youthful life waiting for admission into choose course that is not forth coming. The wisdom in waiting for 6 years at home for one course when there are other courses you should have finished or other routes you should have taken to arrive at fee same destination is very questionable. We have equally seen thousands doing or haven done courses that JAMB or University thrust on them for which they have no passion only to become misfits both in school their and in the society after graduation. Many however get consolation from the fact that many successful people are working in areas outside the course they did in the University. However this should not be the ideal situation, these people are luck to have found their passion after school and have the courage to pursue it. Because millions haven done a course are sentenced to it for life due to the pressure to make ends meet. The ideal situation is that people should find their passion and go for it early in life. They become experts and masters at it and they and the society is better for it. 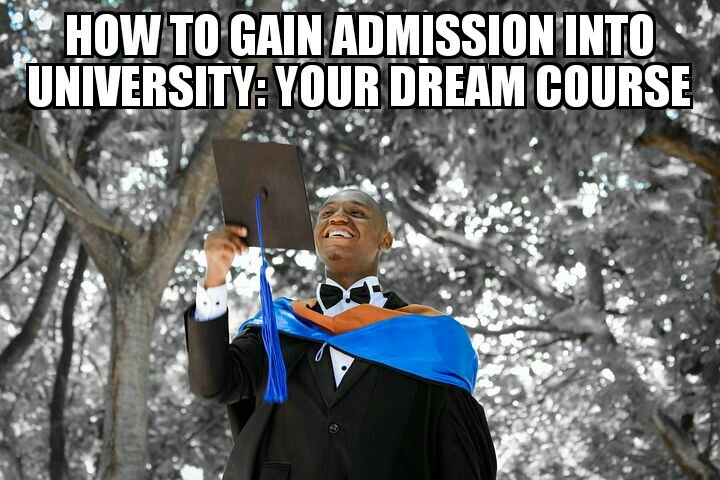 Here is my advice on how to avoid waiting for years without admission. You think you really want to do this course, do you really want that course? Can you do that course? Can you meet up with the demands of the course? Being an doctor, lawyer engineer has demands both in school and in practice. How passionate are you for this course? You need to ascertain how determined you are to work hard and to wait for that course. How long can you wait for it? If you are given another course today will you take it? What other courses can you do apart from your dream course? If you can jump into another course just after one year of trial then you are not passionate enough for it in the first place. I will advise you find another course because even if you get your dream course the sacrifice may not be worth it for you if u do not love that course with passion. If you are willing to wait for years in the face of challenges then you are serious about getting it and you will certainly not wait for too long. Passion increases your willingness to work hard and get anything you want. Hence it increases your chances of success at it. When you see a person who wants something and is passionate to get it. It's very obvious. Being zealous must be balanced with being able though. If you are passionate to be an engineer but you do not like mathematics, you don't know it and you do not want to suffer yourself to know it either. You are looking for a way to avoid coming across it in school. Them engineering is not your area. No matter how you love to be an engineer. You have to know what are the requirements of your dream course and decide if you I'll be willing to give in that. A medical student should read for hours and must divorce from many extra curricula activities in other to cope with the demands of school. Are you willing to do that? These are serious considerations to be made before you start waiting for any course. If your passion is not enough or you cannot cope with the peculiarities, it's better you consider switching to another department that fits your passion and personality. If you have settled those issues then read on. My theory is that if you are good enough academically and have the relevant information about schools and admission it takes a maximum of two years for you to gain admission into any University to do any courses of your choice in Nigeria. GOOD ENOUGH ACADEMICALLY: means you can comfortably sit for any of level exams and pass it without malpractice. Forget the admission rumors about schools not giving admission to deserving candidates. 70% of students who didn't gain admission were not good enough. They were not ready academically. They just did not do well in Jamb and post UTME to qualify them for admission. If a student is good academically only few things will prevent him from gaining admission and that could be relevant information as to how the post utme exam is set for each school, how the exams will be written and necessary requirements for the exams. Just logistical and issues. Students these days do not read and so know little or nothing. They depend mostly on malpractice to pass almost every exam including WAEC, JAMB AND POST UTME. Our level curriculum is the standard of these exams. If you finished the curriculum so well that you can confidently enter any exam hall, write with you head and come out, successful. then you have only started. How dare you cheat your way through secondary school, in WAEC, JAMB AND POST UTME and still open your mouth to say they didn't give you admission. Didn't you notice that people passed that same exams you cheated, with their heads even better than you with all your expo and mercenaries. That you finished secondary school or have you WAEC papers complete doesn't mean that you know all you needed to know as far as O level is concerned. Depending on the school you went to and how serious you were with your books. Most students only become that good to know 70-100% of O level knowledge required to pass any exams after months after leaving secondary school. (this is an indictment on our secondary education system) This is by personal studies, attending lessons, study classes, and some by doing Pre-degree programs in tertiary institutions. So when someone finishes secondary school and arrogantly feels he knows everything. I take just one year of writing JAMB and POST UTME to humble her to begin to see her true level. RELEVANT INFORMATION : by that I mean knowing which schools offer your course and what are you chances in each of the schools. Most State Universities give preferences to their indigenes. so you have better chances of admission if your state university does your choice course. Some Universities have What is called catchment areas. These are states they give a little preference to candidates coming from there. So find out which Universities has your state as a catchment area and increase your chances of admission. Some Universities do not also accept choosing them as second choices in JAMB. If you choose them, you have just wasted your chance. Some even allow second choice candidates to purchase their post utme forms and write the exam but never give them admission. This is the experience of thousands of students. So a succinct information on which schools you should choose as a second choice will save you the mistake of wasting one chance. These are few information and many more you need to arm yourself with if you desire to gain admission into the University and into a desired course. Do well to contact us if you have any questions or clarifications. 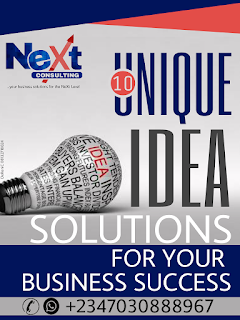 You can comment on the post or contact us on our social media platforms.